I watch this when ever a new video is posted. Don't bother to click the link unless you are with someone who asks you to do plats, braiding or buns. T can easily manage to put her hair in which ever style she wants which is now annoying because I want to sit and do her hair all the time. Not that either of is have the time for my sausage fingers. She has been able to plat her own hair since 5years old because she practiced on the fringing at the end of the rug in her room. Then went onto practice on any grown up girl who would let her. We both watch the videos and got super excited about this one. This is my new fav photo of her. She still has no front teeth and needs her apples chopped. We lost patience in our mother daughter bonding and took the straws out before her hair was bone dry. 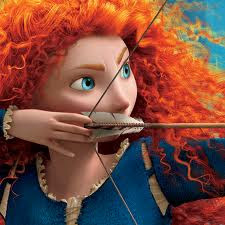 She is supposed to look like Merida. I am sure it was wetter when we took it out and it was poker straight again by morning. Another time maybe. Both girls are desperate for bow and arrows but I am not sure if I am ready for that one yet.